Photoshoots are never a linear process, but rather a makeshift triage of events that need to happen to ensure that you always get the shot. Some are results of timing, some weather and others merely come down to the diva that resides within the athlete. This photoshoot is not that, it is perhaps the furthest thing from it. 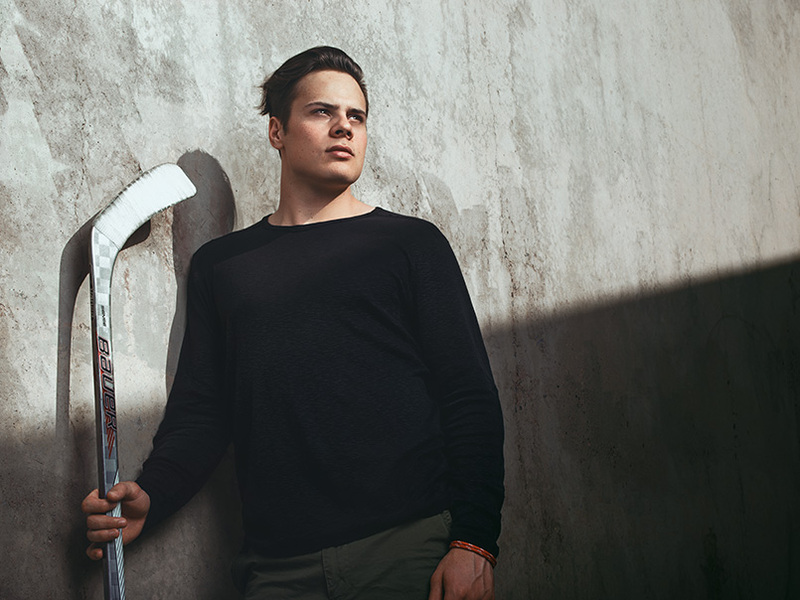 It was my photoshoot with the #1 Draft pick in the NHL, Auston Matthews. The day before I received a phone call from SportsNet Magazine (from Canada, eh) asking if I would photograph two covers for them. 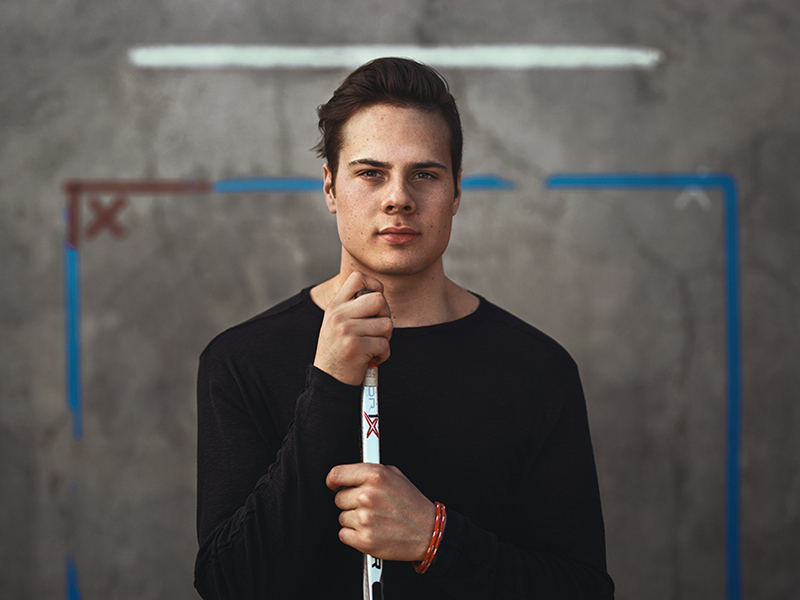 One was of an Olympic runner (blog to come in the future) and the other was Auston Matthews, a hockey player that they described as something truly special. He was described to me as young, talented and had a good head on his shoulders. Now it is not that I ever doubt what a client says, but I do keep my guard up. All too often I have heard of a professional athlete being a really good guy that is easy to work with and what shows up on set is a mega diva (lookin right at you, Bubba). If anything, this is a part of my job that I plan for, after all, kind of a, “let them prove you wrong” kind of thing. The day of the photoshoot I had looked around for locations to photograph Auston, hoping that there was a chance he’d be interested. Unfortunately, there wasn’t a lot in the immediate neighborhood that looked very “hockey,” so I had started the backup plan of building a set in his driveway so as not to inconvenience his time. At that point, my phone rang, it was my producer for the shoot telling me that he would be ready in about ten minutes and to come to the front door. A moment later I knocked and it was promptly answered by his mother, an incredibly kind person that was excited to talk about the trophies he had earned and how proud she was of his character, not just his ability on the ice. Immediately I knew that this was going to be a bit of a different photoshoot than what I was expecting, for it already felt personal. Soon after, Auston walked down the stairs. He was a bit shy, but confident and really wanted to help out the photoshoot in any way he could. I began to talk over the opportunities for photos that we had in our immediate vicinity, they were okay, but not great. At that moment, I remembered back to when I was in high school, and in gym class we used to practice with hockey sticks shooting tennis balls in the racquetball courts. Almost jokingly I pitched the idea of just hopping in my car and driving to my old school to do the shoot there. Auston immediately said he wanted to do it, and with his mother’s blessing, he, my assistant and I hopped in my car and were off to my old high school. On the way there I talked to him about what his future held. I said, “if you get the #1 draft pick, you will be able to choose any car you want…” To which he responded about how much he liked his Jeep and didn’t need a flashy car. I was already seeing that his humility exists at levels not seen in 10 year veterans of pro sports. 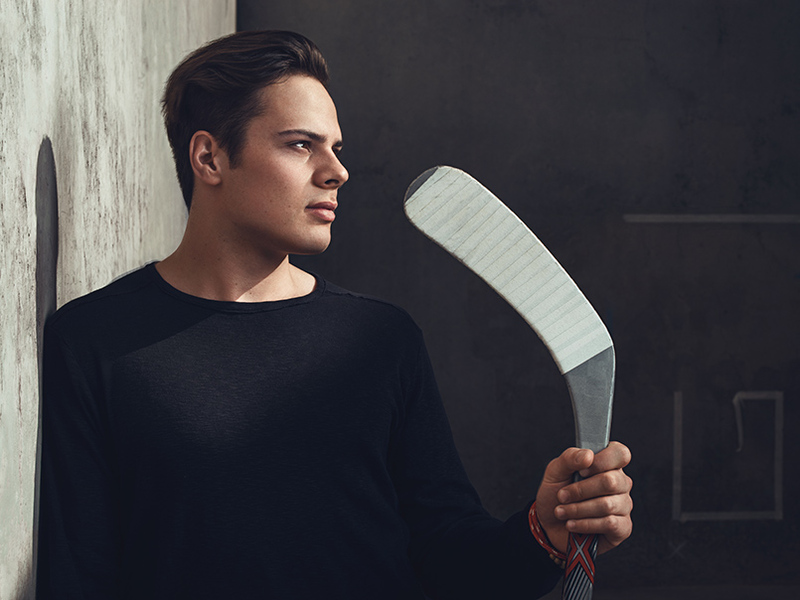 While many kids his age would be excited to enter the baller lifestyle that the money affords them, Auston had his focus on two things; playing his best, and being a good son to his mother. The kid had class. We arrived at my former high school and he, my assistant and I carried gear to the racquetball courts that were not far from the parking lots. We found courts with tape from the previous school year’s classes. What was left of the tape still formed the goals on the aged cement walls. It was a perfect location. We began shooting overall portraits, but soon began to notice that as the sun fell lower on the skyline, it cut hard lines over the courts. The art had presented itself, and we began to explore the idea of shooting in a fashion style for a sports magazine. Worried that the beautiful light was finite in its time upon our set, I chose to shoot first and ask the client later, a decision that proved invaluable, for in five minutes we made more images than could be done in a day at a studio. As quickly as the incredible light had come, it had gone, and we wrapped a shoot knowing it had been a great one. For fun, we hung out and chatted about everything from hockey to life in general as he tried to teach me how to shoot a hockey puck (a feet which Shane Doan was not able to do many years prior). Driving home I told him that he has not only a gift, but a humility that is not often seen in athletes. 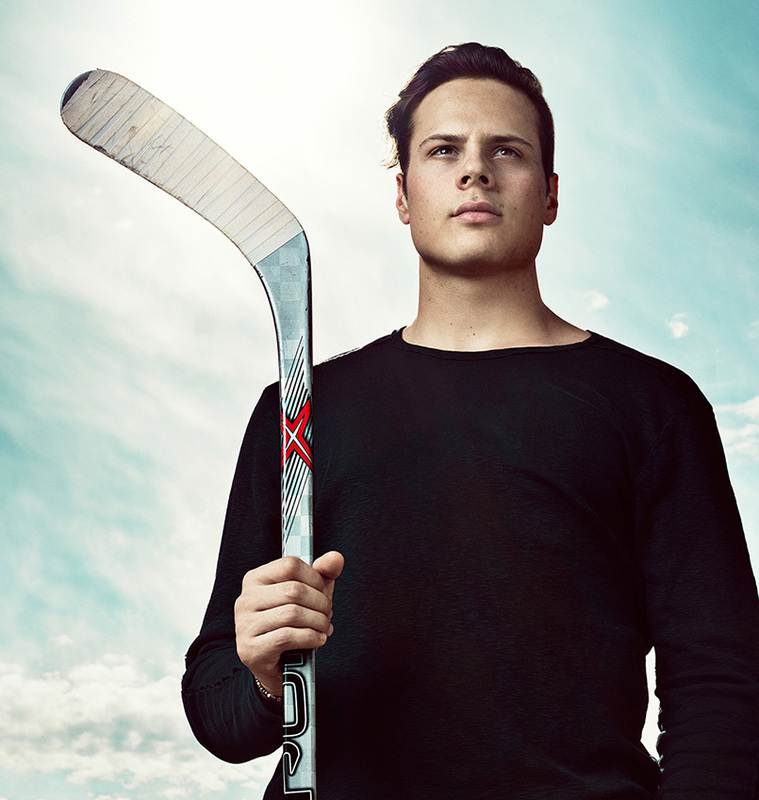 Two weeks after the photoshoot, Auston was indeed drafted #1 in the NHL. Keeping to his dedication to play well, he went on to have the best first game in the history of the sport, scoring and unheard of four goals. He is already a legend in the making.